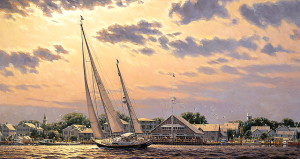 The Deltaville Maritime Museum hosted John M. Barber’s Chesapeake – 50 Years of Maritime Art. 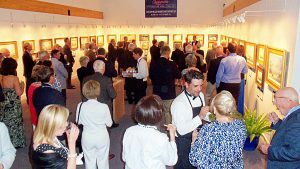 Opening reception of the exhibit June 14 – October 12. 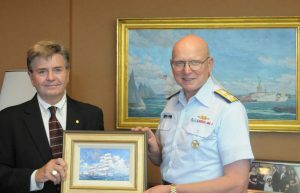 Commandant Admiral Robert Papp reviews the artist’s study for the major painting “Our Flag was Still There” in September, 2011. Awarded the Distinguished Service Award by the National Maritime Historical Society in Washington, D.C. for his efforts in depicting the vanishing ways of life on the Chesapeake Bay and his environmental and philanthropic endeavors to save the Chesapeake. 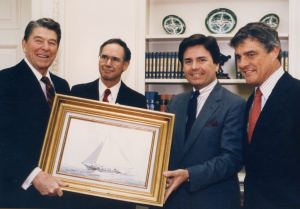 Other recipients of this award include maritime artists John Stobart and John Mecray; yacht designers Olin J. Stephens and H. Halsey Herreshoff; broadcasters and yachtsmen Walter Cronkite and Gary Jobson and Sir Robin Knox-Johnston, CBE, the first sailor ever to circumnavigate the globe non-stop and single-handed. 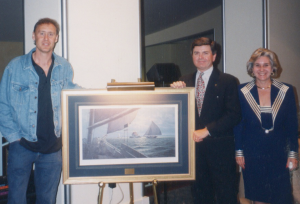 Gary Jobson – world-class sailor, television commentator and author, presents the National Maritime Historical Society’s Distinguished Service Award to the artist at Washington, D.C. Army & Navy Club. Elected to Fellow of the American Society of Marine Artists. Selected by the American Battle Monuments Commission to create the official painting of the WWII Memorial located on the National Mall in Washington, D.C.
“Tribute to a Generation,” World War II Memorial now hangs in the WWII Museum ion New Orleans, LA. 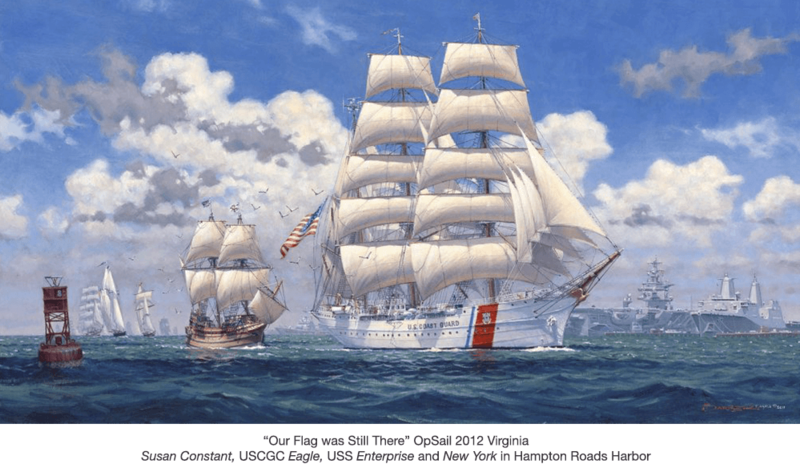 Honored by the Chesapeake Bay Maritime Museum in St. Michaels, Maryland with a 25th Anniversary Retrospective. The museum exhibited 27 original works of art spanning Barber’s career. 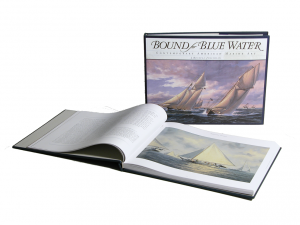 Featured in the publication Bound for Blue Water, the definitive collection of the best American marine art of the 20th and early 21st century, published by the Greenwich Workshop, Seymour, Connecticut. 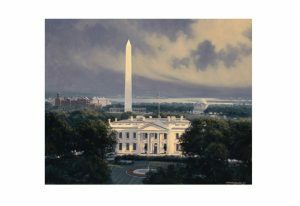 Selected to represent Virginia during the Clinton administration by creating a painting of the White House in Washington, D.C., in commemoration of the bicentennial of the President’s home. 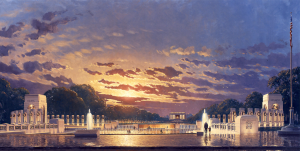 “White House Sunset,” created for the bicentennial of the White House. Copyright courtesy of The White House Historical Association. 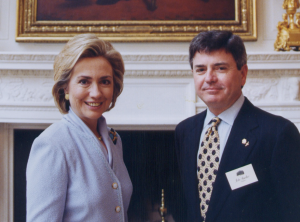 Barber with former First Lady Hillary Rodham Clinton. 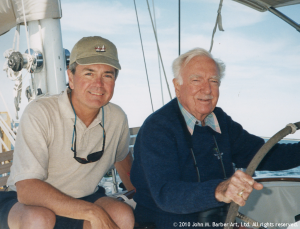 “Wyntje Returning Home” shows Cronkite’s yacht entering Edgartown Harbor, Martha’s Vineyard, Massachusetts. 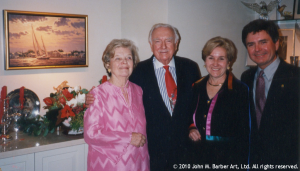 Betsy, Walter Cronkite, Kathy and John at the Cronkites’ 1999 Christmas Party. 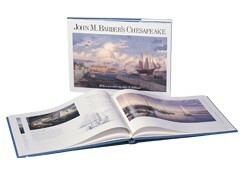 John M. Barber’s Chesapeake, a retrospective fine art book and visual treasury of the artist’s career, published by the Chesapeake Bay Maritime Museum. Bruce Hornsby with John and Kathy Barber on May 6th, 1995 at the Harrison Opera House, for a Chesapeake Bay Foundation event in Norfolk, VA. 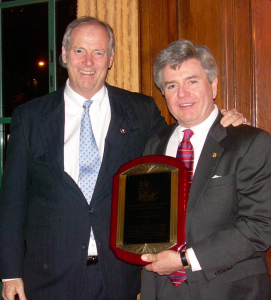 Presented with the Medallion of Honor by the Virginians of Maryland. – Opened The Barber Gallery in Richmond, Virginia. Two Barber paintings included in the U.S. State Department’s “Art in Embassies” Program, which exhibits American artists’ work in U.S. embassies abroad. Elected to the Board of Trustees of the Chesapeake Bay Foundation. Commissioned by the National Geographic Society to create an original oil painting for President Ronald Reagan, which was presented in a White House ceremony. President Ronald Reagan, Gilbert M. Grosvenor – President of the National Geographic Society, John M. Barber and Dennis B. Kane – Vice-President of Television at the Society. Presented with the Chesapeake Appreciation Days Award in recognition of his efforts to preserve, through his art, the last remaining Chesapeake Bay Skipjacks.